Brother Mark Elder says the mural project under the CTA Fullerton station celebrates DePaul as "the little school under the 'L.'" DEPAUL — DePaul University formally dedicated the latest set of four murals under the CTA Fullerton station Friday. Brother Mark Elder, an art professor who uses students in one of his classes to help execute the murals, said they celebrate DePaul as "the little school under the 'L.'" 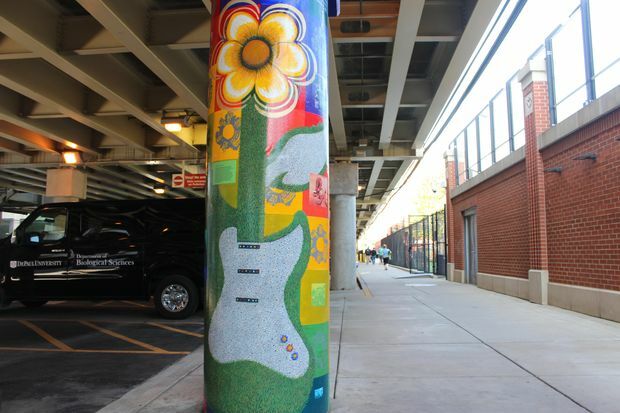 He painted four last year and another four this summer, and said Friday that plans are to do 16 more over the next four years, growing more contemporary as they get progressively closer to the actual CTA station. Elder said they "really point out, in DePaul's history, some of the people who have been with us, as well as some of the great events in university history." Last year's inaugural four were longtime basketball coach Ray Meyer, civil-rights activist and 1948 Law School graduate Benjamin Hooks, 1952 U.S. Olympian Mabel "Dolly" Landry Staton and Minnie Daly and Sisters Mary Teresita Frawley and Mary Clemenza Leahy, the first women to gradate from DePaul, in 1912. 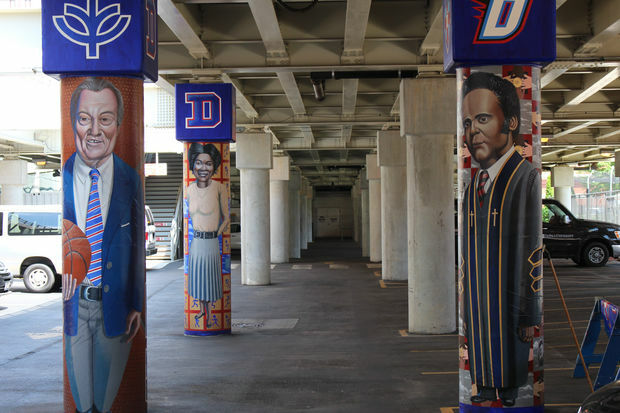 Ray Meyer, Mabel "Dolly" Landry Staton and Benjamin Hooks were among the first DePaul figures immortalized on pillar murals under the CTA Fullerton platform. They're not easily found. This year's additions were the Rev. Francis Xavier McCabe, DePaul's second president, Rose Vaughn and Marion Amoureux, the university's first African-American graduates, the early student athletes known as the "D-Men," who inspired the school's nickname as the Blue Demons, and the close ties between the university and the Sheffield Neighborhood Association. Elder pointed out he placed the McCabe mural next to the one for the first women graduates, because McCabe threw open the school to women. "He went against the grain of the politics of the time," he said. "It cost him his job, when you get right down to it. ... I admire his courage." Elder explained the Sheffield Neighborhood Association mural by saying the two entities "kind of go hand in hand." Association Vice President Ted Wrobleski attended the dedication and agreed, saying, "Sheffield Neighborhood and DePaul University have been intertwined since the inception" of the association in the 1950s. 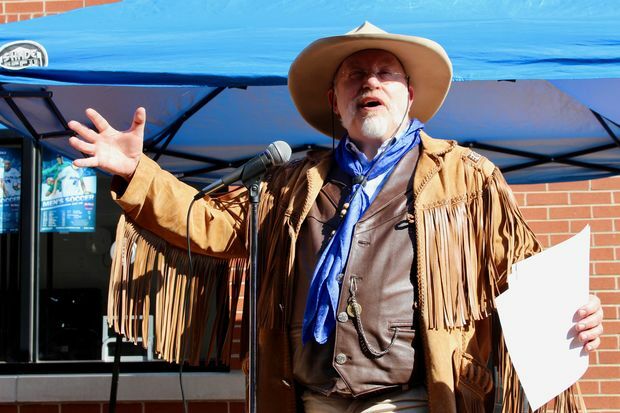 He said over the years DePaul faculty and other staffers were frequently association members, adding, "One of the pillars of the neighborhood has been DePaul." Wrobleski accepted the honor by saying, "We very much appreciate this project and the recognition." Thad Dhorn of the university's athletics department set out to explain: "Why does the largest Catholic University in the United States have a demon as its mascot?" According to Dhorn, the early student athletes 100 years ago were known for wearing a big blue "D" on their sweaters. Newspaper reports began referring to them as the "D-Men," and that evolved into the Blue Demons. Dhorn lauded the murals as "joyous storytelling" celebrating "the tapestry of what DePaul is." Both Elder and local resident Allan Mellis credited Ald. Michele Smith (43rd) with greasing the wheels to get the CTA to permit the mural project under the "L."
"To get the CTA to allow anything to be done on their property is an undertaking," Mellis said. The murals are not in the station at 943 W. Fullerton Ave., but are actually found behind it on the ground level in a parking lot under the tracks, closer to the entry to the university's Cacciatore Stadium. Smith cheered the murals as an example of "the important role that art plays in our civic life," saying, "Public art informs and celebrates as well as shares artistic value on its own." She called the murals "a beautiful addition to our neighborhood." Elder said next year's mural subjects will include basketball great George Mikan and the 50th anniversary of the creation of the Black Student Union. "This time till next time," he said. "We'll be back next year."